We’ve come to the conclusion that a lot of people in Hackney are great. Maybe that’s stating the obvious! Hackney is our home and we are huge fans. We totally appreciate that it isn’t perfect. Deprivation is never perfect and Hackney has more than its fair share, we know that and we only see the tip of the iceberg here at FCFK Hackney. We also know that there is a huge and growing gap between the haves and the have-nots. But at the centre of Hackney’s throbbing heart is a community to be proud of and we are very fortunate to have witnessed that, in spades. Where do we start? Our whole entire service relies on the generosity of our community. Without community we would have no bakers who volunteer their time and resources to bake birthday cakes for children who they don’t know and are unlikely to ever meet. Without community we wouldn’t be able to have spectacular fundraisers (or even unspectacular ones) to raise the vital funds to keep us going. And without community we wouldn’t form partnerships with other Hackney organisations who believe in what we do and send referrals our way. … like the woman who tweeted us to tell us that she’d made a donation to our Local Giving account on her own birthday because she couldn’t imagine celebrating without cake, and she wasn’t even a child. … like Kehillah North London, a liberal synagogue in Stamford Hill, who decided to raise money for us as part of their Purim festival, which involved children dressing up, having fun and sharing sweet treats. Perfect. … like the Clapton Hart who held an Easter raffle – with the grand prize of a scotch ostrich egg, or “scotchrich egg” if you will – all because they wanted to donate to our cause and support local families. … and like our own baker/cookbook amass-er/kitchen lender/host extraordinaire, Debora, who donated her speaking fee from an event with the Stoke Newington WI to us because she’s awesome like that. 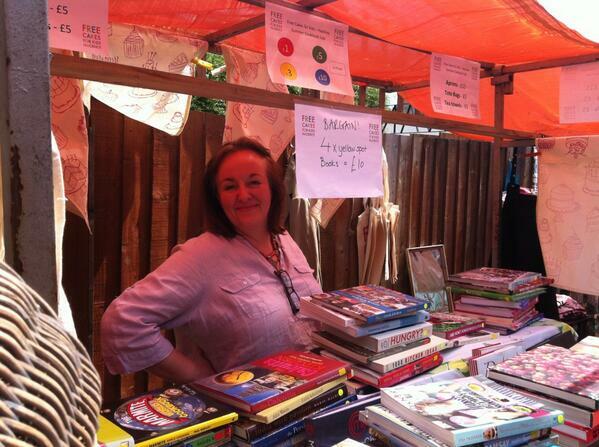 And then went on to hold yet another cookbook stall for us down on Columbia Road. Debora for PM! All of these people, groups and businesses gave to us, not because we asked them to, but because they wanted to do, because they’ve got big hearts that beat to the rhythm of their community and because they believe that by giving a little they can change a lot. We’d like to bag them for our team! All hail Hackney and long live community. As the late, great Mother Theresa once said, “I alone cannot change the world, but I can cast a stone across the waters that will create many ripples.” We ain’t no Mother Theresa, oh no, but we can think of worse role models and we’re all capable of making ripples, however small.